IBM's Watson has been getting up to plenty of late, including fighting the likes of the Zika virus, and now the supercomputer has turned its hand to editing a magazine, no less. The Drum, a marketing site and publication, apparently allowed Watson to edit the latest issue of its magazine, effectively benching the human editor for an AI (at least in some respects). Billed as an issue created by artificial intelligence and edited by Watson, the magazine contains an opinion piece by David Kenny, General Manager, IBM Watson, along with a broad debate on the merits of AI. Apparently Watson also made some guesses regarding the winners at Cannes Lions, the international advertising festival which is underway this week. The Drum produced a tongue-in-cheek video of staff members sitting around doing very little except playing Solitaire or smartphone games, and browsing job websites. Of course, we are still a long way from AI taking over the media (fortunately for us), and while this is still an interesting exercise for Watson, it will be quite some time before the sort of creative thinking which is really needed to be an editor is realised by artificial intelligence. In his opinion piece for the magazine, IBM's David Kenny commented: "Right now AI is more about people querying machines. 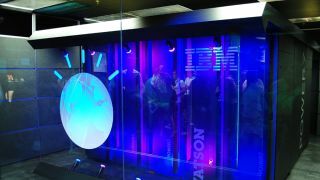 My dream is that Watson will ask us questions, giving computers abductive rather than deductive reasoning skills. Abductive reasoning will lead to conversation and dialogue with humans. "And that in turn will lead to more creative thinking, because machine learning means cognitive computing systems will become smarter over time on their own. We're on that path now, but much work is ahead of us." So how did the mag actually turn out? As Digital Trends reports, you can grab the special Watson-edited issue of The Drum via the outfit's iOS or Android app. Watson, which technically speaking is a service that runs on 90 servers with 2,880 processor cores running concurrently, can perform all manner of tricks these days – just check out our article on five unusual things you can do with IBM's Watson.